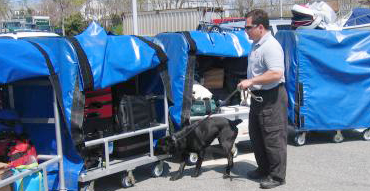 The most important aspects of explosive detection are accuracy and reliability. K-9 SEARCH & DETECTION, LLC‘s K-9s are able to immediately detect both small and large amounts of explosive odors, and can therefore speed up the process of facilitating an appropriate emergency response. They can rapidly screen cargo, luggage and vehicles, cutting down on the time needed to thoroughly scan any kind of area or shipment. Flexibility in the dog’s ability to work in different climates and environments ensures that we can service ports, cruise ships, shopping centers, schools, or any type of building or structure easily and accurately. K-9 SEARCH & DETECTION, LLC uses multiple dogs as a safety measure to provide independent confirmations of alerts. Especially at major ports, this is to ensure the prevention of an unnecessary shutdown, which would result in the loss of time and money. The Maritime Transportation Security Act of 2002 also mandates that all goods being delivered to and from ports be scanned for explosives. The speed of K-9 detection as opposed to any other type of detection means that we are able to assist cruise lines and ferries in keeping to their on time departures and avoiding delays. K-9 SEARCH & DETECTION, LLC‘s bomb detection dogs also service shopping centers, schools, office buildings and anywhere else explosive detection services may be needed. To find out more about more about how our explosive detection dogs can help create a safe enviornment at your facility, fill out our Request for More Information form.